contact centre agent usage, effectiveness. Findings from a 2012 Aberdeen Group research study on workforce management in the contact center indicate that companies using workforce management (WFM) solutions, such as Teleopti, as a part of their contact center workforce management deployments enjoy strong performance on a number of key measurement points, compared to contact centres not using a WFM solution. Of the 166 end-user organisations surveyed in the Aberdeen study, 31 of them were Teleopti users. 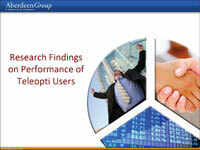 An excerpt is now summarized and published on the Teleopti website “Research Findings on Performance of Teleopti Users”. 88 percent higher rate in automated agent scheduling to meet forecasted demand levels. “Teleopti’s aim is to keep its customers ahead of their competition by optimising, and positively impacting, all areas of customer service from long-term planning and intraday management, to follow-up and performance management. And, based on findings from Teleopti’s own customer survey, with nine out of ten customers recommending our solution to others, we are doing a thorough job meeting their needs,” concludes Düring.